As of July 1, children enrolled in the CCS program who are also Alliance members will have care for their CCS diagnosis covered by the Alliance instead of the local county CCS program. This change is referred to as the Whole Child Model (WCM). The goal is to ensure the coordination of primary, specialty and other health care and support services. The intended result is to improve the overall care of these individuals. The Alliance works closely with the local county CCS programs as well as with CCS approved providers to make sure there is a smooth transition with no disruption of care. please contact us at 1(800)700-3874. What is the Whole Child Model Program? In 2016, the California State Legislature approved Senate Bill 586 which created the Whole Child Model program. The California Department of Health Care Services (DHCS) is overseeing the transition of the California Childrenâ€™s Services (CCS) program into select Medi-Cal Managed Care Plans. The Alliance is one of those plans. The purpose of this change is to improve coordination of care by centralizing responsibility for services with the health plan. All medical care will be covered and coordinated by the Alliance. Instead of arranging for care through two different systems, providers and families will work within one system. 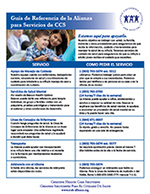 Prior to the WCM, care and services related to the childâ€™s CCS condition were administered by the County CCS program, and non-CCS care and services were provided by the managed care plan. The Whole Child Model serves children and youth under 21 years of age with special health problems and who meet specific medical, financial and residential requirements. 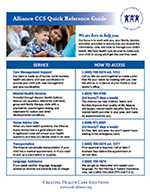 Click the image to view or print the resource guide. Join us! The Alliance will be hosting information meetings in each county to help you learn more about the CCS Whole Child Model program and meet with county agencies and children with disabilities support organizations. Talk directly with representatives as well as Alliance staff. We are here to help you and to answer your questions. We can provide assistive devices such as sign-language interpretation, note taking, and large print handouts. Please call us seven days before the event so we arrange these services for you. If you have questions about the Whole Child Model program, please contact us at 1 (800) 700-3874 or email us at WCMFAC@ccah-alliance.org. Thank you for your interest in the Whole Child Model Family Advisory Committee (WCMFAC) for Central California Alliance for Health (the Alliance) in Santa Cruz, Monterey and Merced Counties. You donâ€™t have to be a committee member to attend a meeting. You can come to observe or share your thoughts. The WCMFAC meetings are held at the local Alliance office of each county and will meet together through video conference. Meetings will last ninety (90) minutes. Monday, March 11 1:30 p.m.- 3 p.m.
Monday, April 22 1:30 p.m.- 3 p.m.
Monday, May 13 1:30 p.m.- 3 p.m.
Monday, June 10 1:30 p.m.- 3 p.m.
Monday, September 9 1:30 p.m.- 3 p.m.
Monday, December 9 1:30 p.m.- 3 p.m.
For questions, please contact Maura Middleton at (831) 430-5567 or email us at WCMFAC@ccah-alliance.org. If you are interested in serving on the committee, click for the online application, download the application, or call 1 (800) 700-3874 and an application will be mailed to you. Simply fill out the application and mail or email it back to the Alliance. If you would like to contact the Whole Child Model Family Advisory Committee, please email us at WCMFAC@ccah-alliance.org. If you would like more information about the WCMFAC, please read the Frequently Asked Questions on this site. If you need language assistance, we have a special telephone line to get an interpreter who speaks your language. For the Hearing or Speech Assistance Line, call 1 (800) 735-2929 (TTY: Dial 7-1-1).